Both frames of the Stanley Cup Finals are now under way with the Tampa Bay Lightning and Vancouver Canucks taking the opening game's of their respective series'. The Lightning jumped out to a quick lead in both their series and game one in Boston. The Lightning's Sean Bergenheim opened the scoring with his eighth of the playoffs and Brett Clark netted his first of the tournament just 19 seconds later in the first period. Before the Bruins could shake off the shock of the one two punch of the Lightning's first goals Teddy Purcell, on the fore-check, stole a puck behind Tim Thomas' net and jammed the puck by an unsuspecting Thomas for his second of the post season. Rookie sensation, Tyler Seguin made his first NHL post season appearance and cut the Bruin deficit to two with the first playoff goal of his career before the end of the first period with a partial break away goal. Lightning defenseman Marc-Andre Bergeron, put the game out of reach when he scored is second of the post season, on a power play goal late in the third period. While the Lightning succeeded to steal away home ice advantage from the Bruins with a final score of 5-2 the Canucks won game one of the Western Conference Finals retaining their home ice advantage in Vancouver. Both teams opened their scoring by capitalizing on mistakes made by the opposing goaltenders. In the first period Roberto Luongo received a dump in behind the net, but when attempting to clear the puck the he put the puck on Joe Thornton's stick. Thornton buried the puck before Luongo could return to the vacant net. Antti Niemi put his team in a similar situation when passed the puck along the board, putting his defenseman in a tough spot to get the puck out of the zone. Canucks fore-checkers forced a turn over and Maxim Lapierre received a pass out of the corner netting the puck past Niemi. The Sharks would answer later in the second with a power play goal by Patrick Marleau and take a 2-1 lead into the third period. The Canucks would walk away with the game in the third period, controlling the tempo of the game and scoring two goals. 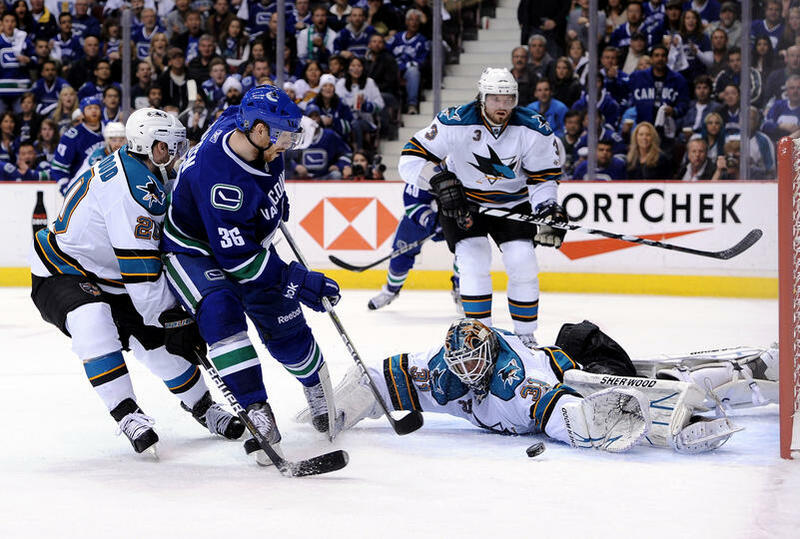 Henrik Sedin scored the winning goal on the power play after receiving a pass from Christian Ehrhoff on the blue line and walked out of the corner around a sprawling Niemi. The Confrence Finals pick up again on Tuesday, May 17th in Boston where the Bruins will try to tie their series with the Lightning at one game a piece.